In April, Tennessee Governor Bill Hallam vetoed a bill that would have made the Bible the official state book of Tennessee. Official endorsement of the Bible would violate state and federal constitutions, according to the governor and Attorney General Herbert Slatery. That last item is particularly poignant as supporters of the bill have “tried to argue the move would highlight the economic and historical impact the Bible has had on Tennessee, saying printing the Bible is a ‘multimillion-dollar industry’ for the state.”3 Talk about trivializing the Holy! In my opinion, the first issue invalidates consideration of the next two. What a mess. Who cares about civil liberties, indeed. Religious fundamentalism concerns me a great deal, and I make no distinction between Islamic and Christian fundamentalists, the latter of which certainly includes Ms. Snider. Replace every instance of God with Allah, and Jesus Christ with Mohammad, and the message reads true, like some screed in which ISIL is taking credit for a bombing. Joshua Barajas, “Tennessee governor vetoes bill to make Bible the official state book,” The Rundown (PBS Newshour blog), 2016-04-15. Dave Boucher, Holly Meyer and Joel Ebert, “Gov. 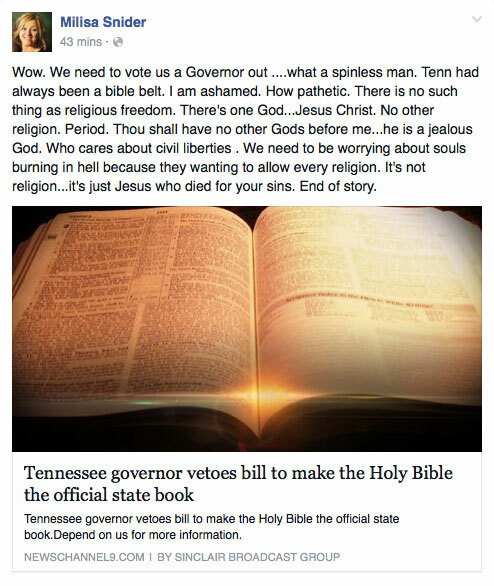 Bill Haslam vetoes Bible bill,” The Tennessean, 2016-04-14.